I know many of you can relate to walking in the valleys of trial, tribulation, and testing this past year. I know it’s been a hard year for many of us as I read your e-mail, and pray with and for you as you struggle to set healthy boundaries and find SANITY in sometimes out-of-control insane situations. As you prepare for the new year it is my prayer for you to know and believe that SANITY is possible! I’m excited to share that resources are now available for you to gather a small group of people, like you, who have challenging relationships with adult children. People just like you who are ready to stop the insanity and start the journey to SANITY in the new year. Don’t wait for another year to go by. The 6-Steps to SANITY and 12-weeks to Freedom program will help you learn if you are an enabler in your adult child’s life—and if so—how to stop; what steps to SANITY you can take; how to yield it all to God and how to develop an action plan allowing God to make a way where there seems to be no way. This 12-week curriculum is now available in a vibrant full-color, spiral bound Study Guide, designed as a companion to the best selling book: Setting Boundaries with Your Adult Children, Six Steps to Hope and Healing for Struggling Parents. Used in conjunction with the book, the SANITY Support Study Guide can be followed in any number of settings, including home, church, and business environments. **PLUS** We now have a separate Leader Guide that contains step-by-step information to plan, organize and facilitate the 6-Steps to SANITY and 12-weeks to Freedom program in your local community or church, even if you’ve never led a group before. Group facilitators will also need a copy of the Study Guide and book, as the Leader Guide is intended as a companion to the 12-week program. Visit our website storefront for more information on acquiring these life-changing resources. Tell a friend in need, help change a life. 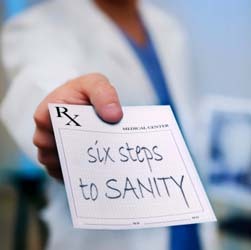 The 6-Steps to SANITY Prescription! I bought your book 4 years ago. The book was my first course in taking back my life and not allowing my adult child control me. My adult child’s life has not changed, but mine has. Sad to say the adult child is still in her own delusional lifestyle and believes she is “right”, but my life has grown with integrity through “acceptance” and “forgiveness”. I no longer “accept” my adult child’s accusations for her own actions and decisions. These are hers and not mine. She tries to “punch” my button by bringing up past, and I realized then the last ditch effort she was using. The past is “past”, but the present moment is “now”, and I chose 4 years ago to go forward. This has been quite a journey, but I now have peace with my own life. Just wanted to let you know your book was the first source of instruction and encouragement during a “negative” time in my life. I have loaned your book several times. Thank you. I’m so glad this book was helpful to you, Carole. Finding peace in life pretty much sums everything up when it comes to making different choices about how we respond to the yucky choices other people make…especially when those other people are our adult kids. Life is too short to stay on the gerbil wheel of insanity. Thank you for your kind words and for sharing this resource with others. Merry Christmas to you and yours this holiday season. I purchased your book “Setting Boundaries with Your Adult Children” a month ago and have just starting reading it. I am asking for prayer and encouragement as I start this long journey. My 4 adult children range in age from 37 to 21, I am near financial ruin and in declining health due to the poor choices I have made in life in regards to my children and relationships. I know God has lead me to your book and website and am trusting Him to provide me with the strength to build the boundaries that I need. Thank you for your faith in Christ and your willingness to share. I bought your book “Setting Boundaries with Your Adult Children” and my husband and I just finished it and we have started the framework for the document that we will present to our 19 year-old daughter. This book has helped us so far as a couple by being a united front, to set-up a plan with consequences, and to give it to God. Each example presented in your book is different as ours is. Does any one have advice for setting boundaries for an unmarried pregnant teen? We have just begun this journey and would like guidance if anyone has already walked this path? I am so glad God has used you, Allison, to give hope and encouragement to parents and families that are hurting. I walked the path….as the pregnant teenager….many years ago. The best thing my mother did for me was to encourage me to become independent and find my own place to live, while at the same time being the non-judgmental rock on which I leaned for the years following. I couldn’t have made it without her help, but her help did not cripple me from being accountable for my actions and choices. I made a lot of mistakes, but my mother never accepted the responsibility for those mistakes. I’m working on the next book in the Setting Boundaries series now, it’s called Setting Boundaries for Young Women and is for young women in the 13-17 year old age range. I’m going to address the topic of teenage pregnancy in this book. Helping your daughter to be independent and accountable is critical…and to encourage her to realize her identity in Christ. I purchased your book, “Setting Boundaries with Adult Children” and finished it in one day. I wish I had seen this book 4 years ago. My daughter is in a downward spiral. I am working on a contract. Under “free stuff” on this website, nothing comes up that I can use. When is something going to be available? I have a dilemma. My daughter has a dog that I got for her when she started cosmetology school a few years ago. She quit after 2 months, but of course, I had already put out a lot of money. She has been in and out of the house several times. Only one time was she able to take the dog with her. He is a very sweet dog, In fact, the best dog I have ever had, but he is a pit/lab mix. She is moving out and I’m in the process of making out a contract. I told her that she has to take the dog or find someone to take him. The apartment where she is going will not take a pit mix. She couldn’t find one that will. I would like to tell her that if she doesn’t find somewhere for him to go that I will take him to the pound. He will immediately be killed since he is a pit mix. I love him too but he is cramping my lifestyle when my daughter is not here. What should I do? Midge, I know we spoke at length via email, but I’m wondering how things are going in your life? Whatever happened with the doggie dilemma? I have a 19 year old daughter who is bipolar very manic right now, and previously very depressed and suicidal last fall. She received a DWI and has been sober for the last 60 days, but she is making very poor choices such as driving without a license, stating as long as she “is not doing anything illegal” she wont get caught. I know this is the manifestation of her mania, and have taken her car, her state id, state resricted drivers license and her access to cash away. She refuses to take her psych meds, and has even lied to her psychiatrist. Do you apply the SANITY principles the same way to mentally ill also? This is a subject that comes up a great deal, and there is such a fine line to be walked under these circumstances. Yes, I believe you can still apply the Six Steps to SANITY with regards to maintaining your own mental, physical, and spiritual health and well-being. Insofar as your daughter, there are many things to consider, primarily that she is considered an adult and is legally responsible for making her own choices….unless you have been declared as her legal guardian? Knowing what is and is not our responsibility when it comes to the choices our adult children make is a critical aspect of finding SANITY…ESPECIALLY WHEN MENTAL ILLNESS PLAYS A PART IN THE DYNAMIC. I always encourage parents to meet with a licensed Christian counselor to discuss their own choices and options given the situation and circumstances … not only the choices their adult child is making. We’re so caught up in the mess they are making that we sometimes can’t see the forest for the trees, and we need to STOP AND STEP BACK (The “S” Step in SANITY) and do our best to view the big picture from a more rationale and less emotional perspective. That’s a really tough thing to do on our own, which is why I believe so strongly in professional counseling, intervention, and support groups. Hang in there, your daughter is blessed to have you. I am 52 years old and have been an enabler my entire life went for a abusive childhood from a family member to an abusive husband who was and alcoholic and drug addict. Now I am being controlled by two of my adult children that have no idea what a boundary is or what gratefulness is. I am now reading setting boundaries with difficult people and the next book will be the setting boundaries with my adult children. I have always known in my heart and have prayed for the Lord to lead me in the right direction, but I always give in to my adult children. I have always been afraid they will not love me, when I really should have been worrying about if they will respect me. I have helped them over and over at the cost of my own sanity. I need to know I am not the only one out there. My son is a “recovering drug addict” and my daughter is just a selfish ungrateful women. Please some one tell me there is hope I can change. One of the hardest things to do for those of us who have developed unhealthy habits is to break the habit of saying, “I am being controlled by (insert name. )…” The truth is, we are ALLOWING OURSELVES to be controlled by (insert name.) No one can control us without our permission. That’s a hard pill to swallow, trust me, I know. But there is hope, Jean! We can always make the choice to change, no matter how old we are, or how long we’ve been repeating the same mistakes. SANITY IS POSSIBLE! Our adult children may never change, the difficult people in our lives may never change, but we can. If we’re willing to do the work (which can sometimes involve unpacking a lot of our own baggage,) life can turn around in amazing ways. You are not alone, Jean, not by a long shot. Just do your best to apply the Six Steps to SANITY every day, and take it one day at a time. My mother is an enabler with my 48 year old brother. He has been through three marriages, each time my parents have paid for his lawyer, she has refurnished his house each time. The last time was with brand new furniture and 47″ flat screen. He works in the same town that my parents live in, he only lives 23 miles from there. He works four 12 hour days, then 3 days off. on the days that he works he stays at my parents. My mom makes large dinners every night that he is there. To add to the situation my brothers daughter who is 20 is now living there also. Last year she took two classes a week at the Central Community College for a total of 6 hours a week. She said she could not work because “I’m in school”. She stays up all night playing “Sims” on the computer or watching t.v. or reading her vampire books., then sleeps all day. The only thing she does around the house is make her bed when she gets up in the afternoon. My dad is 72 and my mother is 67, they go out and mow the lawn, scoop the snow. I was home one weekend helping my parents around the yard and my niece pulled up, and I told her to finish a very small portion of grass that I had not mowed yet, so I could go help my dad move some things. Her response was “I don’t know how to run a mower” and walked inside. It is 90 degrees out and my mother is outside mowing and my niece is inside asleep at 11:30 in the morning. This weekend 95 degrees out and my dad is outside mowing.. Niece is inside asleep. My mother complains about where my brother lives and wishes he would move closer. Why should he, he has the best of both worlds. You make it to easy for him. My parents are very good people, they try to help out so many people, but they do not realize the damage they are doing and that they are being taken advantage of by their own family members. Can you please recommend some reading material that I could send to my parents. This situation is breaking up our family, I am constantly stressed over this. My mother now lies to me when I call home, I live a little over an hour from my parents so it is hard just to drop in. masse corporelle à revenir à l’état d’obésité. qu’il faut pour prendre soin de lui.